1.Place oven rack about 5 inches from source of heat. Preheat broiler to high. In small bowl, whisk mustard and rosemary. Spread baguette pieces with mustard mixture. Place baguette pieces, mustard side up, in single layer on rimmed baking pan. 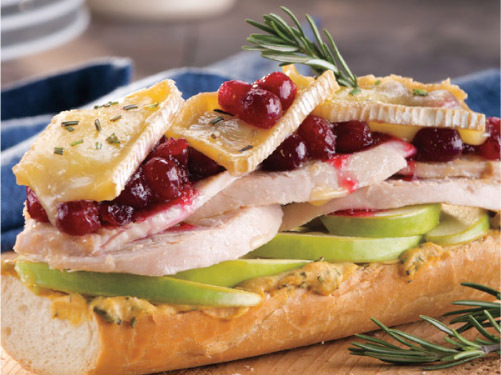 Over mustard mixture, layer apple, turkey and cranberry sauce; broil 3 minutes. 2.Top each sandwich with Brie; broil 2 minutes longer or until cheese melts. To serve, sprinkle sandwiches with rosemary, if desired.